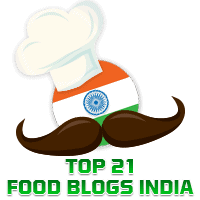 As I have often said in this blog before, for vegetarians in India, paneer or cottage cheese is an ingredient which is greatly appreciated. Elsewhere in this blog, you will find recipes for Garlicky Chilli Paneer, Paneer Jhalfrezi, and Paneer Tikka Kathi Rolls. This interesting snack is adapted from Chatakedar Paneer by Tarlaji Dalal. This came in handy yesterday evening when it was raining and we felt like having a spicy snack while sitting at home. I think this will also make an awesome starter. It is preferable that we use fresh paneer to get the best results. I used store bought Pav Bhaji Masala. Next add the following, one after another: chopped tomato, tomato puree, chilli powder, coriander powder, pav bhaji masala, kasoori methi, and salt. Mix well.